Until I read The Fever by Megan Abbott, We Were Liars was my favorite 2014 book. And then I read The Fever and it was pretty much my perfect book all right there. I tore through it, tbh, reading it all in one sitting. It was the first book by Megan Abbott I've read, and while I've gone on to buy more of her books, I haven't had a chance to read them yet due to concentration issues and fiction everything in general not really being my thing right now. But that's really not a reflection on this book or whether or not you should read it, because OF COURSE I think you should read this book, it's my favorite book I've read this year so far. People had recommended Megan Abbott's books to me because I like Courtney Summers and because I like Gillian Flynn. And while she is not really either one of those authors this was actually a spot-on recommendation, one of the best if you like, you'll like...I've ever ever received. I can't wait, as I write this, to read more of her books, because she is a writer that excites me, that feels like she's really doing her own thing and that thing is full of energy and interesting ideas and oh yeah, GIRLS. 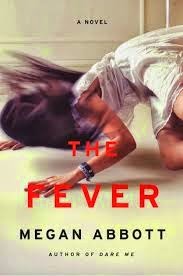 The Fever is about girls and about ~hysteria and paranoia and the general contagion of fear. It's about how we blame everything but the right thing and it's about how we throw up walls and we hide ourselves and we leap to conclusions and we make assumptions and we destroy and we fight for what we think is ours. It's so so so good. I caught a bit of a Twitter conversation where a few bloggers talked about how the characters weren't likable, which is always a surprising feeling to me. Who cares? I thought. That's hardly the point of the book! Besides, these characters may not have been likable, but god did I ever recognize life in them and see truth. I loved how Abbott depicted female friendship in all its messy glory as the thorny, almost brimming with violence, but necessary thing that it is. That was, in fact, maybe my favorite part of the book. This review, I realize, doesn't really give you an idea of what the book is about, but still I think that's best. Just pick it up, you'll see what I mean, especially, if like me, you like Courtney Summers and Gillian Flynn and books about girls that are complicated, and page turners, and just, you know, good books. I received an ARC from the publisher for which I am DEEPLY THANKFUL, because, in case you missed it, I LOVED THIS BOOK.